Time is the last component of our 3-ingredient espresso recipe. It’s measured in seconds, starting when the pump starts, and ending when the pump stops. Time is the least important variable in any espresso recipe, but it can still make or break an espresso. You might have a 20g dose and a 50g yield, but if it’s coming out in 10 seconds, your espresso probably won’t taste so great. You need contact time to extract flavour; to bring out the sweetness and complexity of a coffee. As you’ve read in my last two posts on Dose and Yield, I have a system for espresso recipes. The structure of this system, and the way I think about its components, is always in the same order. Dose first, yield second and time third. The vast majority of espressos made in today’s coffeehouses will have a time somewhere between 22 and 40 seconds. A very large majority of those will be somewhere between 25 and 32 seconds. Quicker espressos will generally have a lighter body and higher acidity. Slower espressos will generally have a heavier body and more sweetness. If the time is too fast, the espresso will be thin, weak and acidic. If the time is too long, the espresso will be bitter and harsh. This isn’t a hard and fast rule, but will certainly apply to most coffees. You’ll notice that I don’t refer to longer times creating higher extractions and vice versa for short times. This is because time and extraction aren’t linear with espresso brewing. More on that later. Time is less important than yield. This means you shouldn’t be aiming to hit a certain time if it doesn’t satisfy the yield as well. Instead, you should be aiming to hit a certain yield, and hoping that it occurs in your desired time. A slight shift in thinking and execution, but an important one. Let’s say your ideal recipe is 20g dose, 40g yield and 30sec time. When making that espresso you would use a dose of 20g, achieve a yield of 40g and aim for a time of 30 seconds. Note that the yield isn’t negotiable, but time is. Why is time negotiable? It’s just not as important. Time in espresso is a weird thing. It’s not as cut and dry as dose and yield are. So let’s dig into that. There are three main factors affecting how long an espresso takes to extract. Imagine two pipes. One is full of rocks, the other is full of sand. Now imagine pumping water through the pipes. The rocks will obviously allow water through much more quickly than the sand. This effect is the same with grind size and espresso. The finer/smaller your grind size, the slower the flow will be. The larger/coarser your grind size, the faster the flow will be. This adjustment can be done with almost every coffee grinder, giving you the freedom to choose the time that it takes to achieve your target yield. Most machines are set to ~9 bar pressure. This is fine for most applications, although there is a lot of experimentation with different static and variable pressures That’s a rabbit hole we really don’t have time for today. Just know that the lower the pressure, the slower your espresso shots will run and the lower the flow rate will be. In terms of flowrate, most machines are somewhere between 250 and 500ml/30sec. You can measure this by placing a jug under a group head sans portafilter, and measuring how much water comes out in 30 seconds. I find anything between 200 and 280ml/30sec to be optimal. Also check that each group is the same or your shots will run differently on each head! Baskets restrict or encourage flow due to how many and how large the holes are. This is called ‘total open area’ or TOA. The more TOA a basket has, the easier it is for water to flow through. Don’t worry too much about this, because you’re smart, and are obviously already using VST baskets, which have optimised TOA for each dose size. Let’s focus on grind size, because that’s what you’ll be dealing with most of the time. Once your dose and yield are locked in, adjusting time gives you a final chance to tweak the extraction up or down. Adjusting grind is the only time that an adjustment to a recipe will result in a simultaneous increase or decrease in both strength and extraction. Remember last week when I said the only way to increase both extraction and strength at the same time is to make your extraction more even? That was true when focusing on adjusting yield, but not once we examine time and grind. Most of the time, an adjustment to a finer grind will increase extraction and strength at the same time. What you’ve done is increased surface area of the coffee which increases extraction, and slowed the shot down which increases extraction as well. This means the yield compromise line I introduced last week moves up and to the right. It’s a much smaller change than yield can create, but it’s important, and can really improve an espresso if used well. Think of yield as your macro adjustment, and time as the final fine-tuning of your recipe. Consider this example. You have a fixed 20g dose and 50g yield. You pull the shot and it takes 25 seconds to reach 50g yield. You have a taste, and it’s thin and sour. This espresso is obviously underextracted and weak. This is a problem that can’t be fixed with a yield adjustment. More yield will make it even weaker and less yield will make it even more sour. A finer grind setting however will increase extraction and strength, reducing that sourness and improving mouthfeel/body. A last minute but crucial adjustment that saves the day! Note that starting this scenario with a fixed time of 25 seconds, and adhering to it, would have resulted in failure. Time comes last. The adjustment of every grinder is a little different, but you’ll soon learn the type of adjustment you’ll need to make to slow a shot down by 2 seconds or speed it up by 5 seconds. If your espresso is too quick or too slow, you’ll need to change the grind. Once you’ve changed the grind, you’ll have to purge the old grinds out. Every grinder holds some coffee in the chute and burr chamber. In some cases, there can be 90g of coffee sitting in there that you need to remove. Be liberal with the amount of coffee you purge out. In the case of a Mazzer Robur, 100g may seem wasteful, but the time and coffee you will save by not chasing your tail are much more valuable. Grinds moving through a grinder aren’t ‘First In First Out”. This means that although some of your new grind setting is exiting the chute, there’s still plenty of the previous grind setting left behind. I like to think of purging a grinder like I think about changing the temperature in my shower. If I turn up the hot tap and I don’t see an immediate change because the higher temperature water is still moving through the pipes. If I’m impatient and turn it up again, I’ll likely burn myself by going too far. Then I have to make another adjustment, which takes even longer. Treat grinders the same way; be liberal with your purging and you’ll end up wasting less coffee in the long run. With timed grinders, you have to monitor the dose after a grind change as well. By changing the grind, you’re also changing how much coffee the grinder can grind per second. Keep an eye out for a change in dose right afterward to avoid being caught out. Keeping your hopper full will also help your time consistency. As the amount of coffee in the hopper gets lower, the weight of beans on the burrs is also reduced. In some grinders, this will make your shots much faster, even if the grind and dose is the same. Never change your dose to control time. A higher dose will slow a shot down, and a lower dose will speed a shot up, yes, but it will also throw all the other decisions you’ve made out the window. Stick to the plan – dose 1st, yield 2nd, time 3rd. A finer grind won’t always extract more from the coffee. There comes a point where a finer grind will restrict the flow of water through the grinds so much that it will decrease extraction and strength. I call this ‘micro-channeling’, where clumps of superfine coffee come together and stay dry throughout the extraction. As you grind finer and finer, it will take longer and longer to reach your desired yield. For a while, this will result in increased extraction and strength. Eventually, you’ll reach a point where the extraction and strength move backwards. It’s like a law of diminishing returns for espresso grind size. The Baristas at St Ali like to call it ‘anti-logic’. Experimenting with grind size will show you when extraction turns back on itself. With a fixed dose and yield keep grinding finer and finer and tasting each shot. You will notice a distinct point where you are not gaining any more extraction or strength. I generally prefer a grind setting that’s slightly coarser than this point, as it will provide the highest extraction and strength for a given recipe. After a couple months of calibrating dose, yield and time to hit this spot, you’ll be surprised just how easy it is to see it coming. Your dial-ins will definitely get faster and faster. This concept was the basis for my 80:20 Method. Keep extracting more until you reach a point where it’s not getting better. Then take a step back and you’ll be at the optimum extraction. Treat time as flexible in order to achieve your desired Yield. Time is your micro-adjustment. Yield is your macro adjustment. Pressure, Flowrate and Baskets all affect Time but you don’t really adjust them too often. Finer = slower. Coarser = longer. Grind as fine as you can without hitting the point of diminishing returns. Purge more than you think necessary after grind changes. So now we have our Dose, Yield and Time sorted. We need to put it all together. Next week, we’ll wrap-up by tackling some real-life examples of espresso brewing and how to approach them using the system I’ve outlined. After reading this, it seems to me that if I want to get maximum sweetness out of a new espresso, I would want to settle on a dose first, then pick a “best-guess” yield, then grind finer and finer until I hit the money spot, then try it at a few different yields to find out what strength works best with that coffee and occurs within a reasonable time frame. Does that seem like the most logical progression? Thanks for your hustles, Matt! How much coffee do i need to purge from a EK43 grinder? Macro and Micro is exactly as I’ve always thought about using dose and time to manipulate the extraction, nice to set it explained so clearly. I often find that they also impact different aspects of the taste balance, with dose/yield having a greater influence I’ve the front of the shot, acidity and sweetness. Whilst time is most useful in controlling the finish. This seems to correlate with how the extraction gradient changes as the shot progresses, a you described in a previous hustle. So that wouldn’t be terribly efficient once you get to the “try it at a few different yields” because you’d have to adjust the grinder for each one. I usually find all of my espressos are somewhere in the 2-2.5 multiple range. So I’ll pull one shot, see what time is. If the time is in the zone (25-35sec) I’ll try it. If not, I’ll move the time into the middle of the zone (aiming for 30sec). Then I can adjust yield without time escaping the zone and be able to move around really easily. Hey Chad – thanks for the kind words. I have really little experience with pressure profiling. I haven’t felt the urge to tackle it until I was really happy with everything else. I think theres a good chance slowing flow at the beginning and the end can improve things, but I’m just not sure yet. Thanks @geradavidson:disqus – the grinder heat is a big one. Is your cafe cold overnight? Do you turn heaters on in the morning? If so, it might actually be the temperature of the beans themselves making the change. Pretty much nothing. A couple beans if you’re being pedantic. Retention on an EK is usually around 0.5g – 1g. Hi Matt, do you mean the difference in temperature of the beans, between a new bag, to beans that are already in the hopper? I am referring to grind adjustment mid service after a successful (and tasty) morning dial in. This could be with a new bag or with beans already in the hopper regardless of change in atmospheric temperature in the store. naturally this could result from the actual bean temperature but I always thought/read/understood it to be due to temperature increase due to increase in grinding. Yeah they definitely change different things. When you describe finish as improving, I would usually also describe it as extraction improving. More extraction = more sweetness = better finish. Well the metal of the grinder will expand and contract with temperature. Won’t be very much but probably doesn’t have to be. This is exactly why we should be discussing flow rates and not pump pressures. As an example our Kees Van Der Westen has a much lower flow rate at 7 bar than other machines. Loving the Hustles Matt, solid info. Do you worry much if time varies by 1-5 seconds shot by shot? It’s almost certainly nothing to do with metal expanding and contracting – all of the research on the topic points to the production of fewer fines as the beans become hotter. This is what influences the flow rate of the espresso. Unfortunately, most of the research on this topic has not been put into the public domain (primarily because it’s been by grinder manufacturers who wish to protect their IP) so the expansion/contraction myth perpetuates. I’d be really interested to do some extraction measurements across different profiles. Chris, Your numbers and hypothesis might be correct, however, if you follow the link I’ve included, spectral analysis of coffee particles, at varying temperatures, have shown no difference in size or distribution. This would indicate that any expansion (if there is actually one) have no effect on grind quality and therefore flow rates. Really neat article. Baskets are really, really porous– water pours readily through them. Given this fact, how do different baskets affect flow rates when a puck is in place? I’m wondering if your shots were weighed or eyeballed for volume. Naked portafilters do tend to produce more crema, which can make them seem to have a faster flow rate if you’re just checking your shot by volume rather than mass. Sorry if you already took this bit into account. 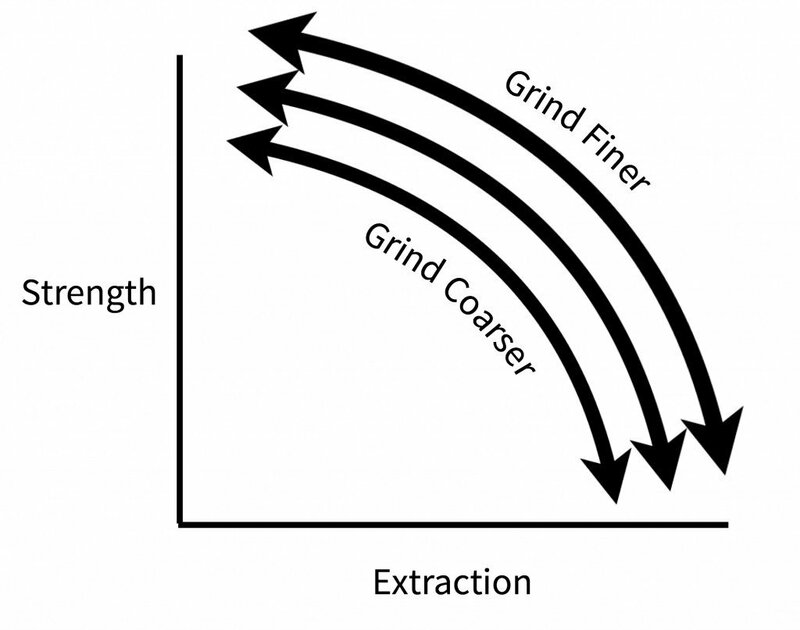 You mention a finer grind increasing extraction and strength but don’t explain why strength increases, so I’m wondering: did you mean to write “which increases *strength* as well” here, rather than “extraction”? hey man, loving the posts – thank you for taking the time to share! what are your thoughts on temperature, you haven’t spoken at all about temperature and from what I have experienced you can radically change the flavour of an espresso by adjusting the brew temp, enlighten us brother? Ah yes, I see, that makes sense. Thanks! My understanding from reading the post it that by increasing extraction whilst maintaining same yield, indicates an increase in concentration(TDS), hence increases the strength of the beverage as there is now more dissolved solids in the same amount of water? Strength = concentration of the beverage? Best Extraction times for ECM? Hi Matt, thanks so much for the resources and the conversation. Would ‘micro channeling’ and subsequent lower, less even extraction be equivalent to the dryness that is often diagnosed as ‘over extraction’? If not, how are we able to extract enough for it to be ‘over extraction’?